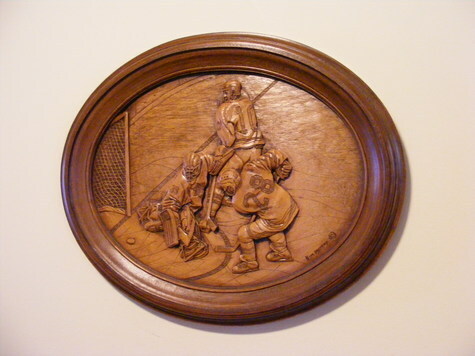 This is a limited edition relief carving reproduction with Certificate of Authenticity (COA) on the back, Individually hand finished, no two are exactly alike. This was a one-time 90-day casting production, now closed. Hockey fans note: features player jersey numbers 28, 10, and (goalie) 35. Oval, 16x20 inches. Perfect condition. Location: Ottawa Canada (Kanata Ontario Canada). Local buyers: we can accommodate pick-ups almost anytime 10am-10pm any day, but only by prior appointment. Prices are cash. While you’re here, ask to see our “Garage Sale Room” with dozens of decor, kitchen, dining, sports, entertainment and electronics items, collectibles from the 1960s, 70s and 80s, and hundreds of books. Get 10% off everything in the room on the same visit! Out-of-town buyers: Shipping charges are extra. Shipping is usually by ExpressPost. Item price plus shipping cost must be paid before we ship. We accept PayPal & Interac e-Transfer [a.k.a. Interac Email Payment] or will hold your item for 10 days on request if you prefer to pay by postal money order or mail us a check. Uncertified checks must clear the banks before we ship. US dollars accepted at par. Call Gary at the number above, 10am-10pm Eastern time, or contact me by e-mail (use the “Contact Seller” button). Please provide a shipping address including postal/ZIP code if you are inquiring about shipping charges.